Manchester United players were visited by some club legends after today’s legendary comeback victory against Paris Saint-Germain. The Red Devils made Champions League history by coming from 2-0 down from the first leg at home to win 3-1 away and go through on away goals tonight. Unsurprisingly, some big names from United’s past wanted in on the action, as shown in the social media posts below. Eric Cantona and Sir Alex Ferguson posed with interim manager Ole Gunnar Solskjaer, whose magical run in charge at Old Trafford continues with probably his best result by a long way. 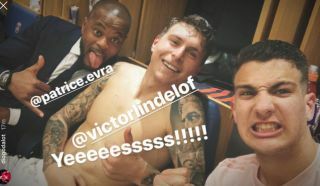 Elsewhere, Patrice Evra posed for a dressing room selfie with defenders Victor Lindelof and Diogo Dalot. What a night for everyone involved with Man Utd!